Receipt of Delivery is a weekly series featuring Bay Area exhibition mailers selected from the SFMOMA Research Library’s collection of artists’ ephemera. “Probably nobody knows what Diane Arbus as a person was all about. As a photographer, some people admired her work, others reviled it and some simply ignored it. Rarely, if ever, have I seen such deification of a personality and that person’s work as has followed Diane Arbus’ suicide. […] It was with singular visceral reaction that I received Edmund Shea’s announcement of his exhibition Memorial Tribute to Diane Arbus at the de Saisset Art Gallery at the University of Santa Clara. Worse yet, the announcement bore a photograph in which two roses and “I Love You” had been painted on a light bulb. “I decided to forget the whole matter, without traveling to Santa Clara to see the show. Then, on second thought, I decided to ask Shea, “Why? Was he too on the bandwagon of making use of the publicity of a person’s death?” I was quite blunt in my telephone call. “Shea’s response, without hesitation or affront, was — She was my friend. I met and liked her before I even knew she was a photographer. She was really special. Like when I went to New York, I called her. She had me come over for breakfast. I never knew anyone else who would do that… He wove an image of a woman who had touched his life, who had left him wounded by her death. He added, You know, when I was thinking about this memorial of mine, all of this other stuff started coming out. I’ve wondered, too, how she’d feel about it all? “If the foregoing seems a strange way to introduce an exhibit review, it isn’t really. Shea’s exhibition is a special memorial to Diane Arbus, for it is just as much his own grief that he shows — and he has used photography as the basic ingredient of his works. The exhibition consists of three large pieces. The central image is an approximately 25” x 40” enlargement of the front and back of a postcard sent to Shea by Arbus in 1968. She is writing in reply to his having sent her some photographs he took of her — Dear Edmund. I really hate photographs of me. I don’t figure people should have to look at how they look to other people… These are the words of one of the world’s best-known photographers of people who are freaks and misfits! 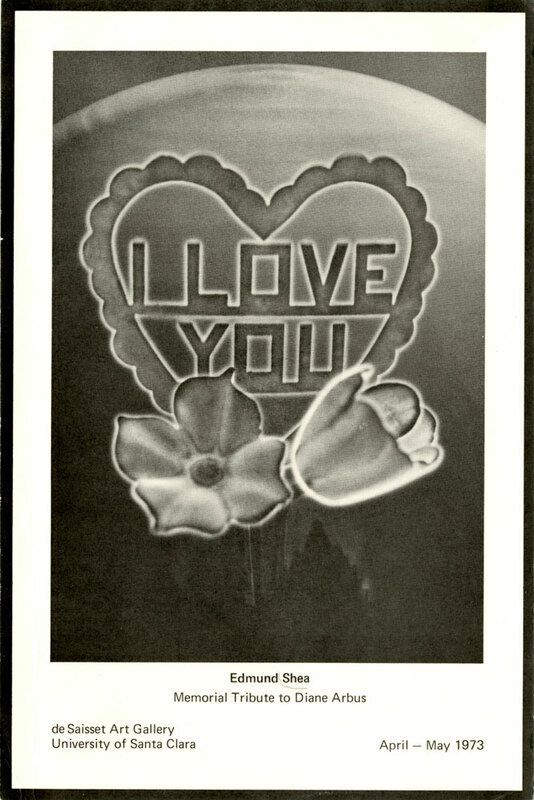 The flowers and the heart containing “I Love You” were made of frosted, translucent plastic, and were inside the lightbulb, not painted on it. They glowed when illuminated. Edmund had the light bulb at his studio. Thank you, Tanya, for bringing to the light some of the lesser-acknowledged artists from the 1970s. Edmund Shea was an exceptional photographer and some of it was due to his personality, low-key, intelligent and kind, with a subtle sense of humor. He had many friendships and collaborations including Bruce Conner, Hunter Thompson, Richard Brautigan and many others. I can still hear his laugh when I think of him. Thank you both for sharing these reflections.